here's barely anything available below $400,000 in Bend right now," says Kim Gammond, communications and public affairs director of the Central Oregon Association of REALTORS. "Even if you have 20 percent down, you're getting beat out by cash buyers from out of the area, and you're not competitive in this market. There's no inventory." Year after year, Gammond notes that Bend real estate values have been increasing by a steady 10 percent. "Even if you're pushed to the outlying communities, such as Redmond, it's rising at 8 percent a year." And Prineville and La-Pine? A whopping 20 percent. The standard homes—often "three bed, two bath"— have all but disappeared in the Central Oregon market, according to Gammond, while the "missing middle" — the triplexes, fourplexes, bungalow courts and townhomes that add high density to the landscape are often absent in mid-sized, burgeoning towns such as Bend. Add in a rapid price increase which conditioned a market to support only the highest income earners, and you've got a squeeze on most of the market. As prices rise, low-income earners are pushed into the middle market, often spending more than the U.S Department of Housing and Urban Development's 30-percent-salary-for-housing recommendation. To tackle the "missing middle," local nonprofit Bend 2030 established its Bend Collaborative Housing Workgroup Steering Committee, working on increasing supply, availability and affordability so that middle earners can afford to live in Bend. end 2030 recently concluded a 12-month, 500-hour project, including a panel of city workers, developers, builders, realtors, architects, affordable housing advocates, community leaders and city councilors to develop policies aimed at increasing middle market housing. Focused on families earning between 80 to 175 percent of the Area Median Income, the group recommended tools to spur housing for those making between $40,000 to $90,000. "We started with 50 or so tools," jokes Gammond, "and we narrowed it down to 12 that were put to City Council." "City Council was very receptive with our proposals," says Bend 2030 Executive Director Erin Foote Morgan. "They help prioritize solutions to our housing crisis, which may be implemented with strong support from a broad cross-section of community members and organizations." 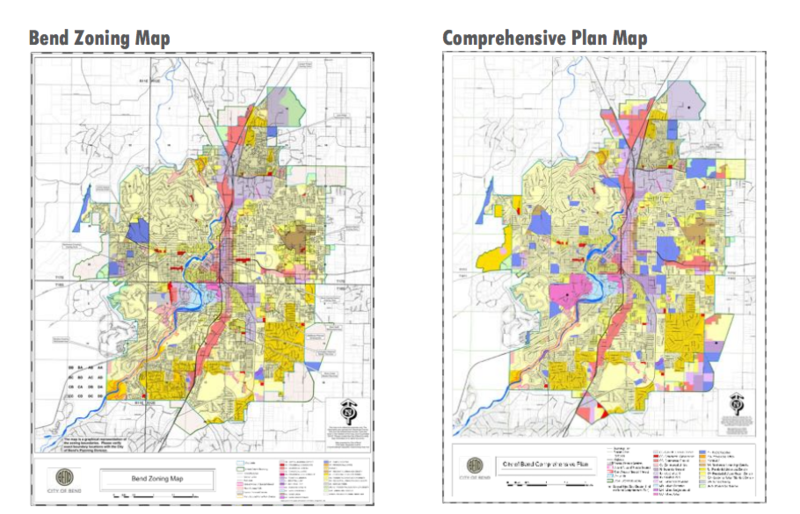 or Foote Morgan, the most important tool is the first one: implementing the new urban growth boundary plan, involving rezoning areas to fit into the comprehensive plan adopted — but not fully implemented — in November 2016. Residential or industrial zones could be converted to multi-use zoning to allow for additional housing and greater density. The UGB expansion, at times controversial and hotly debated, was approved and mandated by the State of Oregon last year. "The City did actually rezone some areas after the UGB passed, for example, from industrial to mixed-urban in the new Korpine and Central Districts," says Kirk Schueler, president and CEO of local developer Brooks Resources Corporation. Both Schueler and Gammond were members of the Bend 2030 committee. Schueler thinks the rezoning of only a few districts and not the entire comprehensive plan happened because certain areas can be controversial. "Anytime you're changing a zone, a dispute with neighbors can occur. They may not want to be next to something that's changing from residential to multi-use. We hear a lot of, 'Well when I bought it, it was residential." The State requires the City to have a comprehensive land-use plan, and higher-density—rather than sprawl—is preferred. Schueler points to the Vehicle Miles Traveled, an index assessed by The U.S. Federal Highway Administration. Lowering VMT, often through high-density areas and transportation corridors, is the go-to method adopted in Bend. Increasing density in central areas, promotes active transportation solutions, such as cycling. "The thought is that small community models yield a better transportation system and lower VMT," says Schueler. "If you can bike or walk somewhere, then you lower VMT, and higher density areas often yield amenities and better transportation systems. It's very expensive to operate a public transport system if you only have a few people using it. You need to have that higher demand created by higher density." Still, the density question has brought some controversy. In a letter sent to Bend 2030 May 24, Paul Dewey, executive director of Central Oregon Landwatch, wrote:"While we share the goal of achieving more affordable housing and middle housing, we don't believe the case has been made that additional density measures in existing neighborhoods beyond what was adopted in the UGB Plan are necessarily appropriate at this time. We are not convinced that what will be built will end up being either affordable or middle housing and we believe that existing efficiency measures need to be tried out to test both their effectiveness and their compatibility with existing neighborhoods." o accommodate an increase in housing, the 2030 group also recommended allowing fourplexes in standard residential zones—provided the floor plans were scaled to reflect the size of a traditional single family home. "Fourplexes can be designed quite beautifully and in line with the currently aesthetic we have here in Bend," says Foote Morgan. "They can look like a larger home if done right." A fourplex in Portland, Oregon. Foote Morgan is quick to point out that the goal is not to implement tall, blocky apartment buildings, but rather, fourplexes and similar buildings that fit the feel of the neighborhood. "You see them in the westside," says Gammond, "They are adorable and desirable, with a low impact on the community." aking out these zoning restrictions would ostensibly motivate developers to build densely, as would restructuring System Development Charges, the group posits. Currently, there's no incentive for a builder to build smaller units, as the SDCs they pay are the same for a 3,000 square foot home or an 850 square foot apartment, Foote Morgan says. The recommendations did not include word of reducing or eliminating SDCs currently taken by Bend Park and Recreation District. In a similar vein, the group says tool seven—allowing for a vertical housing tax exemption—would also bolster density. The tier system would mean waiving property taxes of up to 80 percent for a 10-year period, based on the number of floors of residential housing built above commercial spaces. "So a developer would be incentivized, for every floor above the commercial space, up to 80 percent," says Foote Morgan. The report noted that the average height of these buildings is only three to four stories. Cities including Grants Pass, Roseburg, Eugene and Portland have already implemented similar strategies. ther recommendations include improving urban transportation corridors throughout the city that are zoned as mixed-urban, and creating transitional corridors around higher-density arterial roads. The idea is to make non-vehicle travel easier. Tool six tackles reducing parking requirements for new builds, currently averaging two spaces per unit, in order to foster less need for vehicle use. The recommendation could also mean more on-street parking, increasing congestion. On the flip side, reducing parking requirements would also incentivize infill units such as Accessory Dwelling Units to further lower housing production costs. or now, Bend 2030's recommendations are simply that — recommendations. Foote Morgan says the City Council was receptive to the recommendations during a July 19 presentation. Schueler, noting his 23 years of industry experience, cautions: "Nothing in real estate moves fast. Nothing in planning occurs overnight." Still, the first step is planning. "If you don't do the planning, if you don't have the vision, the code, the zoning, then you really will be left in a much worse place," Schueler notes. He points to the Old Mill District, which, "is just now finally taking shape and yet it was started some 15-17 years ago. Or NorthWest Crossing; we started that vision back in 2001 and it took a long time for it to come true. And it didn't please everyone." The committee will host a number of upcoming public meetings to showcase the recommendations and give community members the chance to offer input. Gammond laments, "How do you create communities that look like our past community? How do we start blending these communities together so we aren't just in our own silos and single family homes in the cul-de-sacs? ...The recommendations reflect a spectrum of our community values: sustainability, home ownership, livability and attainable housing."